Chesterfield slumped to yet another defeat, this time at the hands of Walsall. The struggling Spiereites looked to have turned a corner with their remarkable win last weekend. However, Sam Laird grabbed the only goal of the game at the Bescot Stadium as Chesterfield suffered their 21st league defeat of the season. Gary Caldwell’s men now only have 10 games left to overturn an eight-point deficit and retain their League One status. Despite pulling off a string of fine saves German stopper Thorsten Stuckmann could not deny the hosts three points. After picking up his first win since taking charge, boss Caldwell named an unchanged starting line-up from the side that beat fellow relegation strugglers Swindon. Ched Evans came off the bench to assist Reece Mitchell’s first professional goal, but he was replaced in the squad by David Faupala due to yet another injury. 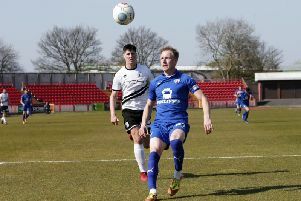 Despite his stoppage-time heroics at the County Ground, Mitchell had to be content with a place on the bench at Walsall. In the 16th minute Kristian Dennis had the ball in the net, only to be flagged for offside. Spireites were caught out a minute later with Simeon Jackson hitting straight at Thorsten Stuckmann after a burst down the left. Stuckmann snuffled a Saddlers’ chance as he dived at Isaiah Osbourne’s feet. Eight minutes before the break Stuckmann pulled off a sublime stop to keep out Kieron Morris’ left-footed shot after he beat Angel Martinez. It took the hosts just eight minutes to unlock the door after the restart. Morris had an effort deflected for a corner, with James O’Connor winning the initial header to leave Laird a simple tap in. Minutes later Osbourne fired a strike marginally wide. Osman Kakay missed a chance to put the visitors back on level terms after being played in behind at Sylvan Ebanks-Blake. At the other end Stuckmann again denied Morris, tipping a powerful strike past the post. In the dying embers Sam Hird forced Nigel Ethieridge into a save with a header as Chesterfield’s hopes of an equaliser vanished. Walsall: Etheridge, O’Connell, O’Connor, Laird, McCarthy, Morris (Dobson, 77), Chambers, Osbourne, Edwards, Oztumer (Makris, 84), Jackson (Bakayoko, 58). Unused subs: MacGillivray, Preston, Randall-Hurren, Moussa. Chesterfield: Stuckmann, Anderson, Evatt, Donohue, Kakay, Martinez (Gardner, 57), Hird, Grimshaw, Jones (Mitchell, 58), Ebanks-Blake, Dennis (Faupala, 81). Unused subs: Fulton, El-Fitouri, Humphreys, Simons.